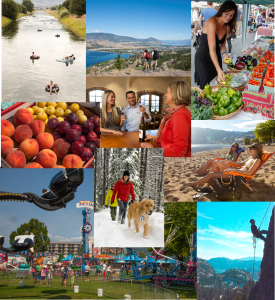 Top 10 Things to do in Penticton - Make the most of your vacation! There is so much great stuff going on here that the top 10 things to do in Penticton list is just the tip of the iceberg. We want to make sure that your stay with us is unforgettable and the list below highlights just some of the activities that make this city so special. Float ‘the Channel’ between Okanagan and Skaha Lake. Tour and taste at any of the 60 plus wineries within 20 minutes of the city. Relax on one of our beautiful beaches. Attend one of our many annual events and festivals. Pick fresh fruit at a local orchard. Warm up to winter with great outdoor activities (skiing, snowboarding, snowshoeing, skating). Shop like a local at the numerous retail outlets and boutique stores around the city. Discover the best of Penticton & Wine Country to make the most of your visit. Click HERE to download a map of Penticton.